Cord-Free Random Orbital Machine Polishing - Anytime Anywhere! The FLEX XFE15 150 is a cordless random orbital polisher with a 15mm throw that will easily remove swirls, scratches, and much more from your paint and all without the hassle of mains cables! 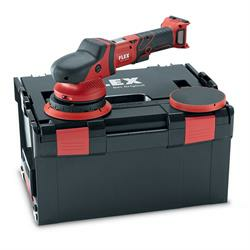 Many months of development went into the design of the XFE15 150, as importantly, FLEX had to ensure the power and torque of the standard machine was replicated in the new cordless model, something they are justifiably proud of achieving. With an average full-power run time of approximately 40-48 minutes from each 5Ah battery and a 45 minutes full recharge time, you can be sure that you'll never run out of power! When machine polishing a car with a cabled tool, there is always a risk of the cable rubbing against the panel you have just corrected, with the inevitable consequence of having to complete that panel again. Getting rid of the cable completely makes the FLEX XFE15 150 Cordless Random Orbital Polisher the perfect tool for professional detailers, mobile valeters and car care enthusiasts.